Posted on 03/20/2016 in Game Recaps. 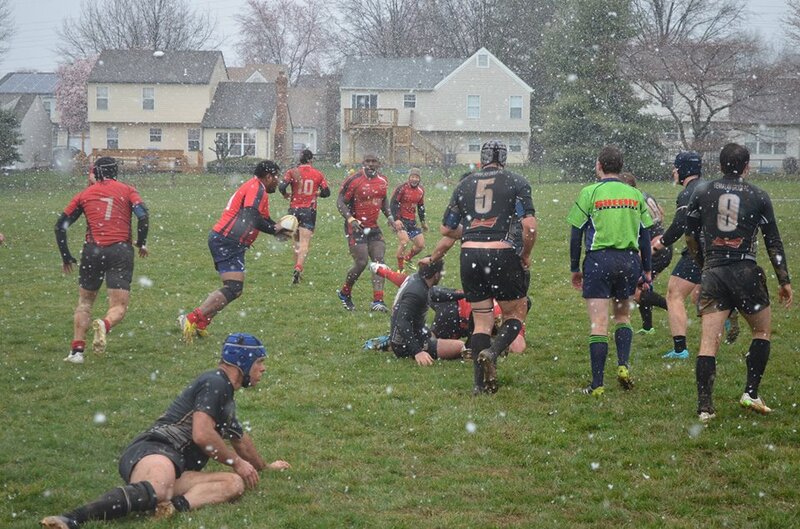 The Potomac Exiles came from behind for two wins on a snowy Saturday at Resnik Elementary in Gaithersburg. In the first match, the D3 side took on a mixed team of NOVA reserves, college guys and old boys. The forwards took control early with a driving maul, dotted down by Augie Dominguez, who joined in on the fun from the wing. From there, it was a back and forth affair, as Potomac gave up the second half lead. Prop Dom Smith, double dipping on D1 and D3, brought the team back as he barreled in for the try to close the gap, 17-15. The hosts completed the comeback for a 20-17 win. The D1 side followed similarly, as a great line from Zolen “Z” Rodriguez was rewarded by a feed from scrummy Augie and the early try. Potomac gave up the next try, but fullback Allan Stafford ran through the NOVA defense and slotted his second conversion to put the Exiles back on top. A poorly executed exit kick allowed NOVA to break through again and close the lead to 14-12. Potomac marched the ball down the field, but an incorrect call by the sir after a penalty ended the half with the hosts knocking on the door to extend the lead. As the snow picked up, the second half was an especially sloppy affair, with knock on after knock on from both teams. A penalty kick by NOVA put the visitors in front with 25 minutes to play. For the next 15 minutes Potomac struggled to maintain possession with mistakes in both the loose and set pieces and saw scoring opportunities go begging. Finally, with under ten minutes to play, Rob Newcombe broke the NOVA defense and put the hosts on top, 19-14. Running pick and goes and playing strong defense, Potomac worked the clock, and second-half scrummy Quigley kicked the ball out with no time left to seal the win for the home team.